gingertom wrote: That is a fantastic image Strum. I would interpret it as illustrating the everlasting preponderance of nature over human materiality but also showing the saffron-like fragility of both. Maybe it shows how, we as humans, can and do, by our actions, negatively impact on that which sustains us.....which we can so obviously and so easily, take for granted. Thank you GT, very eloquently put. I'd love if you could review all my paintings. Rocker wrote: Hey Strum, that is too melancholic!! I heard that Rocker, the cliffs got a severe bashing. It wouldn't surprise me if the line has to be redirected in the future for fear of landslides. The cliffs behind Bray Head are scary. Great pic Strum. Travelling from Greystones to Bray is still one of the great rail journeys, I never tire of it. I'd hate to see the journey change because of erosion. There is so much to see,the Guillemots are just arriving to nest and there will soon be hundreds of youngsters mixing with the herring gulls and cormorants. A few years back there were a family of wild goats there and I've seen hares, otters and other wildlife along the cliffs. Going to work was always made a little more tolerable by just watching the activities that occur there. Denis Cromie wrote: Great pic Strum. Travelling from Greystones to Bray is still one of the great rail journeys, I never tire of it. I'd hate to see the journey change because of erosion. There is so much to see,the Guillemots are just arriving to nest and there will soon be hundreds of youngsters mixing with the herring gulls and cormorants. A few years back there were a family of wild goats there and I've seen hares, otters and other wildlife along the cliffs. Going to work was always made a little more tolerable by just watching the activities that occur there. Here's a recent painting. I made most of this up so the Cliifs are actually much closer to the line than this and they are much steeper. I don't think there are any inlets like this either. Artistic licence, the only one you don't have to pay tax on yet. 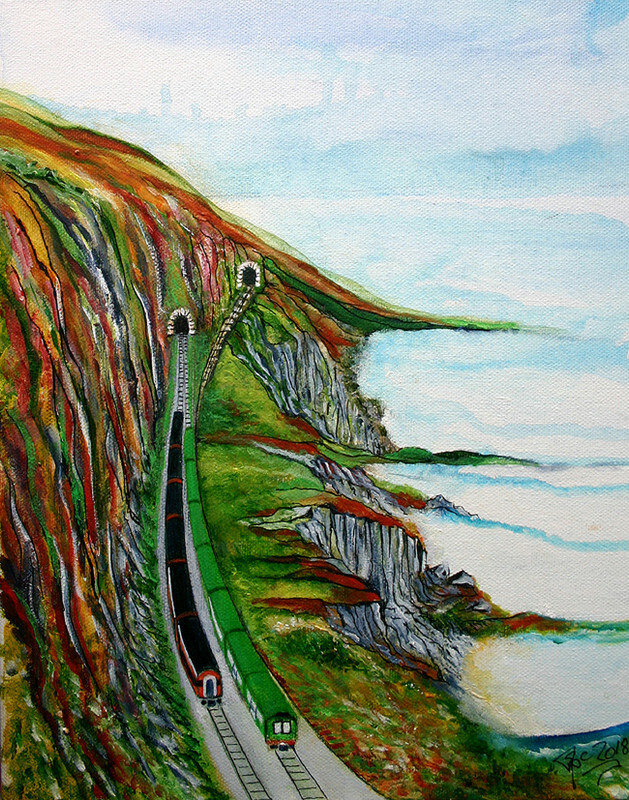 "View from the Cliff walk" Acrylic on Canvas. EDIT: That was a few weeks ago. I have embessished it somewhat since. Denis a great description of your commute to work you obviously hadn't your head stuck in a phone like today's travelling public like a horse with a nosebag,lovely painting strum. Holla wrote: Denis a great description of your commute to work you obviously hadn't your head stuck in a phone like today's travelling public like a horse with a nosebag,lovely painting strum. I was just thinking that too!! Our wonderful coastline never ceases to amaze me. The sea is constantly changing colour/waves/dead calm. I can't imagine ever living too far from it! During my 40 odd years daily commute I only travelled from the Rock to Dublin but I got the beauty of the marsh and the strand at Merrion. I loved every weekend getting the DART the other way towards Bray and Greystones and I'm always glued to the window watching. Now that i am retired the world is my oyster and the views are free!! Smashing painting Strum. I love they way you use artistic license to feature both the mainline service and the Dart service even though it's only a single line ,I use both regularly. Heres a bit of useless information. The disused tunnel on the right hand side is called the Brandyhole Tunnel. Immediately this side of it there was a wooden bridge over a small inlet called Brandyhole (where smugglers used to bring Brandy ashore). The bridge was the scene of a major accident in August 1867 which claimed the lives of 2 passengers. The line was subsequently moved inland to the tunnel on the left. I remember that story Rocker. Clever me, I never knew there was a second tunnel. Denis Cromie wrote: Smashing painting Strum. I love they way you use artistic license to feature both the mainline service and the Dart service even though it's only a single line ,I use both regularly. Thanks a lot Denis. Using my licence I was sorta kinda portraying the old and new. Cheers. Just to let you all know Harjoe is fit and well ! He's found himself in the same predicament as Enviro 500 in that he can't access the site for some reason ! keeper wrote: Just to let you all know Harjoe is fit and well ! He's found himself in the same predicament as Enviro 500 in that he can't access the site for some reason ! Hi Keeper. I reset his password a few weeks ago and tried it myself and managed to login. I thought that maybe there was something wrong and then I thought,maybe he's been sent to the Sin Bin as he was quite often in his football career( I still have the marks as evidence). Seriously glad to hear that he's well so that we can all look forward to his posts when he gets sorted. That's brilliant Strum, hope we'll hear from him soon ! keeper wrote: That's brilliant Strum, hope we'll hear from him soon ! I second that. Harjoe we need your imput. We have been quiet here! I’ve had trouble as well but it is a regular thing ! . I thought it was admin clearing out people who don’t drop in ! spudseamus wrote: I thought it was admin clearing out people who don’t drop in ! Thank you Jenny. Long time, hope all's well. You didn't have a problem logging in though, phew. Loved seeing the little black cat when I logged in. Good to hear from you Jenny. Is there still a history of the building of the line to Greystones in the Station? ?